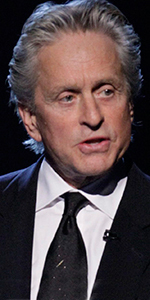 Michael Douglas is a Hollywood icon. Son of another icon, Kirk Douglas, Michael carved his own way into the Hollywood mainstream, starring in several films which have defined more contemporary movie-making. Michael was born to actors Kirk Douglas and Diana Dill, who had met as acting students. The two divorced in 1951, when Michael was seven. Father Kirk married Anne Buydens, who became Michael's stepmother up to the present day. Educated in private schools on the eastern coast, Michael studied drama at UC Santa Barbara, receiving his BA there in 1969. During that time, Michael played a driver onscreen and was assistant to his producing / starring father in Cast a Giant Shadow (which played the Chinese in May, 1966). Kirk must have instilled in his son a passion for producing; Michael has produced many of the films he has starred in, and has produced a slew of other films. Michael has done surprisingly little television, starting out on an episode of CBS Playhouse called "The Experiement" with John Astin, aired over CBS in February, 1969. Kirk produced the feature Summertree (released in June, 1971) for Michael to star in with Brenda Vaccaro, then did a Disney wildlife pic, Napoleon and Samantha (released in July, 1972) with Jodie Foster. Douglas' real breakthrough came when Summertree writer Edward Hume asked Douglas to play detective Steve Keller in a show he was creating: The Streets of San Francisco with Karl Malden, which aired over ABC for 98 episodes from September, 1972 to June, 1977. During that time, Michael dusted off a play his father had staged, and turned it into a starring vehicle for Jack Nicholson: One Flew Over the Cucckoo's Nest (released in November, 1975). This remarkable film wowed the Academy: it won Oscars for Best Picture, Best Actor and Actress, and Best Director for Milos Forman. Michael Douglas was now a thing. He starred in Michael Crichton's Coma (released in January, 1978) with Geneviève Bujold; he got third-billed (behind Jack Lemmon and Jane Fonda) but also produced The China Syndrome (released in March, 1979), and starred in Running (released in October, 1979) with Susan Anspach. After headlining in The Star Chamber (released in August, 1983) with Hal Holbrook, Douglas put on his producer's hat again and starred in Romancing the Stone (released in March, 1984) with Kathleen Turner, and its sequel, The Jewel of the Nile (released in December, 1985). He was executive producer for Starman (released in December, 1984) with Jeff Bridges. One of Douglas' signature roles was in Fatal Attraction (which played the Chinese in September, 1987) with Glenn Close, and another was in Wall Street (released in December 1987) with Charlie Sheen. Director Ridley Scott put Michael in Black Rain (which played the Chinese in September, 1989), and he starred with Kathleen Turner in The War of the Roses (released in December, 1989) back when they allowed Danny DeVito to direct films. He produced Flatliners (which played the Chinese in August, 1990) with Kiefer Sutherland, then starred in the whopping hit Basic Instinct (released in March, 1992) with Sharon Stone, then starred in the allegorical Falling Down (which played the Chinese in February, 1993) with Robert Duvall, and produced Made in America (which played the Chinese in May, 1993) with Whoopi Goldberg. Disclosure (released in December, 1994) with Demi Moore, became a big as well, followed by The American President (released in November, 1995) with Annette Benning, a solid hit — almost all of Douglas's films during this period made $100 Million or more, and in this eara, that was a lot of money! He was executive producer for Face/Off (released in June, 1997) with John Travolta, then was invited down to the Chinese to make his imprints just a few days before the opening of The Game (which played the Chinese in September, 1997) with Sean Penn. Many people consider his turn as a writer in crisis in Wonder Boys (released in February, 2000) with Tobey Maguire, to be his finest performance — the film did surprisingly well — Douglas could pull 'em in. This was certainly true for Traffic (released in January, 2001) with his new wife, Catherine Zeta-Jones, but it never hurts to rely on real marquee power, staring with his father, Kirk, in It Runs in the Family (released in April, 2003) with Bernadette Peters. His badder than you persona helped with The In-Laws (released in May, 2003) with Albert Brooks, but he played Benjamin Franklin in two episodes of Freedom: A History of Us aired over PBS in February, 2003. Starring with his Flatliner star Kiefer Sutherland became The Sentinel (released in April, 2006); then Douglas continued his comedy series with You, Me and Dupree (released in July, 2006) with Owen Wilson. The indie film Beyond a Reasonable Doubt (released in July, 2009) with Jesse Metcalfe, fell lfat, but Wall Street: Money Never Sleeps (released in September, 2010) with Shia LeBeouf, didn't. Douglas and his Traffic director Steve Soderbergh went way out on a limb with their biopic of entertainer Liberace, in Behind the Candelabra with Matt Damon, aired over HBO in June, 2013. More conventional was And So It Goes (released in July, 2014) with Diane Keaton. More recently, Douglas has played scientist Hank Pym in Ant-Man (which played the Chinese in July, 2015) with Paul Rudd, and its sequel, Ant-Man and The Wasp (which played in July, 2018). Meantime, he produced the remake of Flatliners (released in September, 2017) with Ellen Page, and stared as an acting coach on The Kominsky Method (streaming over Netflix in November, 2018) with Alan Arkin. Mann's Chinese Theatre, Hollywood, California. 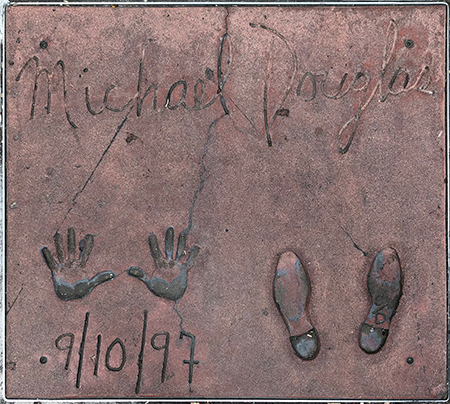 Michael Douglas Forecourt ceremony, Wednesday, September 10, 1997. 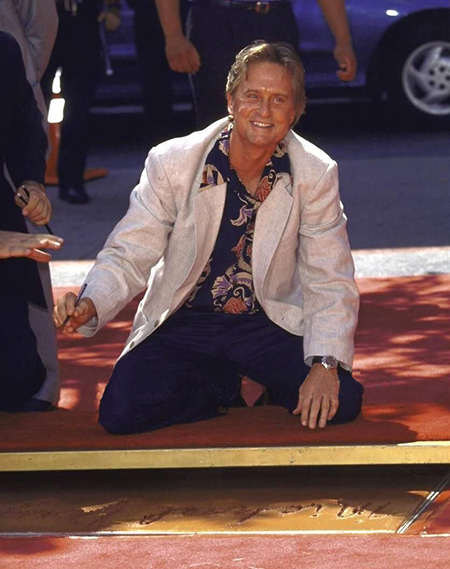 Michael Douglas flashes a smile after inscribing his signature into the cement.